Introduction to 3D Scanners - CMM Inc.
How 3D scanners work and what to consider when purchasing a 3D scanner. Even the best metrologists are only as good as their tools. At one time, that meant calipers, gauges and other hand tools. Today, the metrologist’s arsenal includes even more sophisticated equipment, such as coordinate measuring machines, laser trackers and 3D scanners. (Left) A machinist at the Tabor Company in 1905. (Right) A BLAZE 600M blue light scanner. The tools of the trade are getting more complex with each passing year, which is why it’s worth pausing from time to time to appreciate how they actually work. Of course, each of the tools mentioned above can be based on one or more technologies, and each has its own advantages and disadvantages. Let’s focus on one tool in particular: 3D scanners. Broadly speaking, there are two types of 3D scanners: laser scanners and structured light scanners. 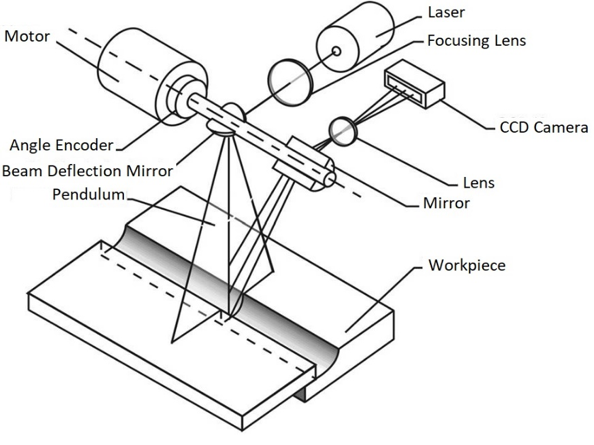 Although both types operate on the same fundamental principles, there are some important differences between laser scanners and structured light scanners in terms of their relative precision and respective applications. The majority of laser scanners use a combination of guided laser beams and distance measurements. Calculating a laser pulse’s time-of-flight between the scanner and an object yields a distance measurement. So, by taking thousands or millions of measurements, one can combine the resulting individual points into point clouds and meshes. 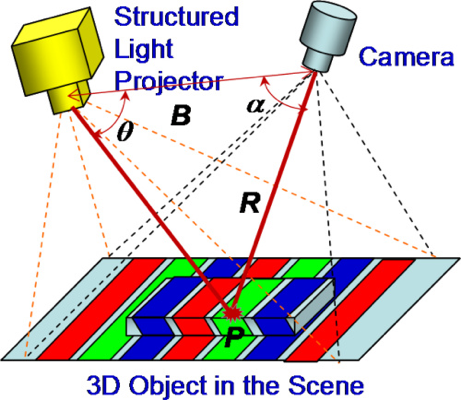 In contrast, structured light scanners take measurements using projected patterns of light and a camera system. Since the illumination from the light patterns appears distorted from different perspectives, the scanner can use this phenomena to create an exact geometric reconstruction of the surface. Projecting patterns consisting of many stripes or arbitrary fringes at once allows the scanner to acquire multiple samples simultaneously, increasing measurement speed. These fringe projection systems are able to measure the entire surface of an object, and their high point density results in more precise measurements and higher levels of resolution compared to a laser scanner. However, fringe projection systems also work best in closed rooms with tight controls on ambient conditions, such as heat and temperature, though some systems are more flexible than others. As an example, Hexagon’s WLS qFLASH is a compact white light measuring system that projects a random pattern on the measuring object and analyses the surface feature and edge lines utilizing stereo vision. This technology works best for thin wall parts, castings and accurate measurements of features and edges. Blue light scanning provides maximum definition on shiny parts and performs better under variable ambient lighting. As an example, the BLAZE 600M is a compact 3D scanning solution that’s very similar to the qFLASH. Both systems have extremely fast data acquisition, completely eliminating vibration issues. In addition, the BLAZE combines stereovision with structured light, which allows it to operate on any type of component in any type of environment. AICON’s structured light scanners produce much more surface detail than the qFLASH, though they also have more difficulties with edge detection. The scanners operate on a miniaturized projection technique, also known as active triangulation. This makes the company’s SmartSCAN breuckmann scanners capable of fast data acquisition, even on the complex surface geometries of fragile or deformable parts. The SmartSCAN series is designed to deliver a higher level of data quality and resolution, as well as easier handling, compared to a high-end laser scanner. The SmartSCAN’s modular system configuration and compact, low-weight design make it well suited for mobile use. The SmartSCAN sees significant use in the automotive industry, with applications including quality inspection of sheet metal hole patterns and trimmings, quality inspection of gear transmission casings for commercial vehicles and quality inspection of crankcases for four-stroke engines. The PrimeSCAN is AICON’s entry-level solution for applications requiring 3D digitalization of industrial components. Like the higher-end SmartSCAN, it is based on fringe projection technology. The PrimeSCAN also works with AICON’s OptoCat software, using the same algorithms for creating precise point clouds. The PrimeSCAN offers 22 fixed configurations, with different resolutions and measuring fields to cover a variety of measuring tasks. It can be equipped with either blue-light technology for industrial applications or white-light technology for applications requiring additional color information. Since the PrimeSCAN’s working distance is short, it’s best suited for desktop applications or narrow environments. What degree of portability do you need? What degree of accuracy are you working to? Are you measuring production parts or one-offs? Although a great deal of metrology still takes place in the lab, many applications require measurements to be taken on the shop floor. AICON’s PrimeSCAN and SmartSCAN can be used in either environment, but that’s not true of all 3D scanners. Environmental factors, like ambient lighting, are a major consideration for many 3D scanners. You should also think about the requirements of the measurements you’ll be taking. If you can complete all your measurements using the scanner’s battery alone, then combining the 3D scanner with a scanning arm is a good option. If you need more space, a laser tracker or vision system may make for a better pairing. This is a fairly straightforward question to answer. If you’re working in the 30 – 50 µm range, a good portable scanner should serve your needs. If you need accuracy in the sub-15 µm range, then you’ll need a structured white or blue light system. Though the specific measurement requirements change, the value of accurate measurements holds true at every stage of a product’s lifecycle. If you’re measuring one-off parts, then a hand-held laser scanner is probably a good choice. On the other hand, if you’re measuring production parts, a stationary white light or blue light system is a better option. An additional advantage of using a camera system for production parts is that the part fixture can be targeted with reference marks, enabling parts to be rapidly exchanged on the fixture with no degradation of accuracy. As some parting advice, the accuracy of a 3D scanner can be misrepresented, so before you purchase a laser scanning system, have its results checked on a coordinate measuring machine. Alternatively, you can use a golden part with known dimensions and surfaces. It’s easy to be misled by beautiful color maps, but great shading doesn’t mean you’re getting anything close to the accuracy you think you are. You should also remember that many 3D scanners have a sweet spot from which salespeople tend to collect their results. In any demo situation, make sure the entire area of measurement—including the depth of field—is fully exploited and checked for accuracy. Metrologists depend on the tools of their trade, so it’s worth taking the time to choose the right ones for your application, and to ensure their accuracy. If you’re looking for more advice on 3D scanners, ask the experts at CMMXYZ.